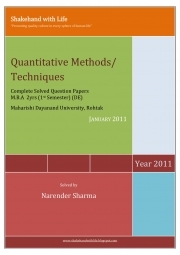 Description of "Solved Paper Quantitative Techniques/Methods January 2011 (eBook)"
This solved paper is very much useful for those students of MBA who are enrolled with MD University under distance mode and are going to take examination in July 2011. Paper has all the question solved with the help of MS-Excel and advanced statistical software MINITAB. Reviews of "Solved Paper Quantitative Techniques/Methods January 2011 (eBook)"